Tree Shirt? Get yours here! These feel really comfortable. I’ve had mine for a few weeks and I love it. It’s a very soft, high-quality shirt. Still feels the same after many washes.We have just about every size, including toddlers. 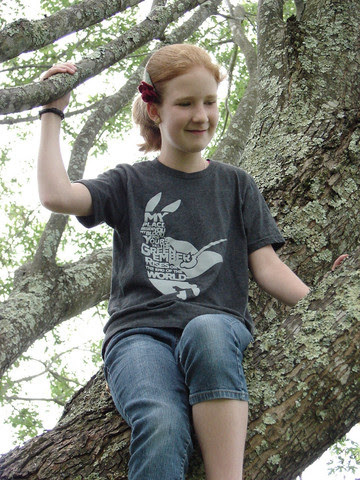 The toddler shirts are light grey, with black print. We have a limited inventory, so you need to hustle to be sure we still have your size. Now, a word about the designer of this fine item of clothing. Our friend Erin Tegeler, an amazing artist, created this design. It’s based on an illustration Zach did in The Green Ember of an attacking rabbit. It features the oath that resounds in Ember and ties the two books (Black Star and Ember) together. Erin has an eye for beautiful things, is a compassionate, thoughtful person, and one of the world’s very bets photographers. She’s also funny and cool. Her and Pete live in Washington, with their beautiful kids. We loved this design so much that Andrew (the publisher) put it on the back of the new book. Thank you, Erin, for this awesome design and for all the encouragement you Tegelers have been to us. Hi there. 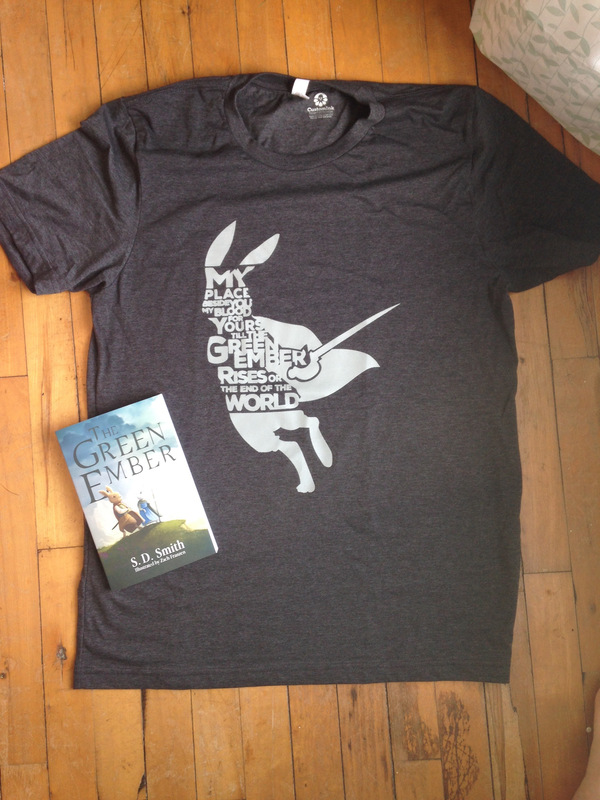 We are trying to have a Green Ember birthday party for my 12-year old daughter and I thought it would be fun to give the green ember t-shirts as a party favor. Do you know when they are going to be in stock again. I love the saying that ties the two books together. We are printing it on the evite invitations. Can you contact me at 817-602-0432 and let me know if I can order them directly through the manufacturer. Thank you very much. Hi Kelly! I’m just seeing this. We are not planning to restock the oath t-shirts at this time. I hope the party is spectacular. If you have further questions, feel free to shoot me an email – josiah@sdsmith.net. We would love these shirts as well! Please consider re-stocking them. 🙂 And PLEASE tell us there’s a book #4 on the way! We JUST finished #3 and are anxious! What?? No more shirts? Now they are even more valuable!!! Hi Tricia! Yes, we haven’t had these since early in the year. We do have wonderful Mended Wood shirts that are also very popular. Keep an eye on the newsletter for any new shirt related news. We are really disappointed there are no more oath t-shirts available! Why not offer both designs? Any chance you will have any more before Christmas?